Tonight I decided it was high time to use up three leftover egg whites that had been languishing in the fridge for a few days. After perusing some recipes at work on Friday afternoon, I had settled on amaretti cookies, in part because they called for that exact number of egg whites and in part because I’d never tried them before. The hitch was that I ended up using one of the egg whites last night to make that warm goat cheese salad, so when I went to make the amaretti, I ended up with a stray egg yolk after all that. 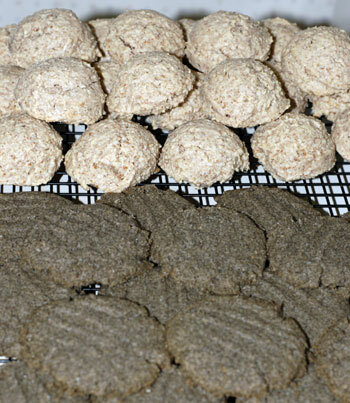 It was all the excuse I needed to make a half-batch of buckwheat cookies, my very favorite little grey cookies. The amaretti went over well—Jeremy kept returning to the kitchen for seconds and noted that they taste like marzipan. Mine was still warm when I ate it, and I thought it was alright, but I’ll have to try a cooled one now for comparison. I should note that I used whole, unblanched almonds and ordinary granulated sugar, whizzed up together in the food processor for a slightly browner and coarser finished product than was likely intended. The buckwheat cookies, I know from experience, I can hardly stop myself from eating. Of course, this array of little Italian cookies is still a far cry from what Jeremy actually requested for dessert today, namely oatmeal chocolate chip cookies. Oops. Guess those are next on the list….